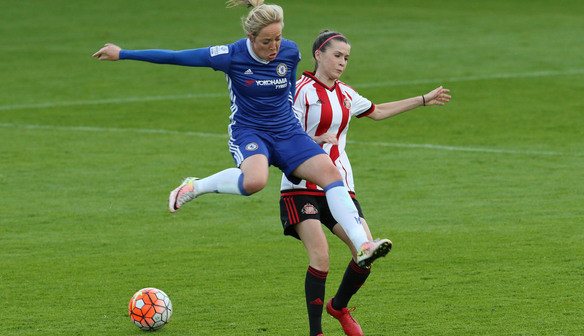 Gemma Davison got off the mark for the year in a thumping win for Chelsea at Sunderland but believes patience was the key in a 5-0 victory. Claire Rafferty got Chelsea on their way with a first-half double before Davison made it 3-0 at the break. In the second half Millie Bright and Ji So-Yun completed the win to help Chelsea close the gap at the top of FA Women’s Super League 1 to two points with a game in hand on leaders Manchester City much to the delight of Davison. Davison said: “I’m really happy to have scored. I haven’t scored this year so it was a great but I’m really happy for the team and the performance and we’ve started off the second half of the season how we wanted to. “We always knew we were going to be in the title race. There are some good teams involved here with Man City and Arsenal. You never know what will happen in this league. “I think the main thing we wanted to focus on was being patient and not getting frustrated with their block and we kept patient, moved the ball quickly and broke the deadlock. We’ve been putting a lot of hard work on the training ground and it’s paid off. We could have had more and we just want to build on it. Karen Carney set up Rafferty for the opener just before the half-hour, and two quick goals before half-time made the game safe. First Rafferty poked home after Davison’s shot was blocked before Davison turned goal-scorer from Ji’s cross. In the second half Bright made it four from the edge of the box before Ji topped it off five minutes later, and Sunderland defender Steph Bannon admitted Chelsea’s class had told. She said: “Going into the game we were quite confident. On our home ground we thought we could get something but Chelsea have some fantastic players, full of internationals. And they had five chances and they scored five goals. “I think we competed for the first 20-25 minutes and we matched them across the park. But once the first one went in, two and three came in quite quick succession and at half-time, we’d given ourselves a mountain to climb. Sunderland (4-3-3): Rachael Laws; Danielle Brown, Stephanie Bannon, Hayley Sharp, Victoria Williams; Rachel Furness, Brooke Chaplen, Madelaine Hill; Abbey Joice, Stephanie Roche, Beth Mead. Substitutes not used: Hilde Gunn Olsen, Kelly McDougall. Chelsea (3-4-3): Hedvig Lindahl; Millie Bright, Niamh Fahey, Jade Bailey; Ana Borges, Katie Chapman, Drew Spence, Claire Rafferty; Ji So-Yun, Karen Carney, Gemma Davison.